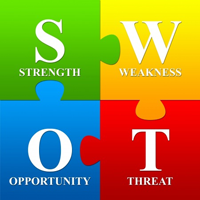 This article analyzes the strategy of the worlds leading furniture retailer, IKEA using the SWOT Methodology. The company was founded in 1943 and is known for its simple yet effective approach to retailing with the DIY or the Do It Yourself concept, which ensures that the company keeps costs to a minimum and passes on the value to the customers. The products sold by IKEA are mostly ready to use and flat packed meaning that they can be assembled by the customers themselves. The company has a presence in the online world as well and the total sales from its online and offline businesses are more than a Billion Dollars per year. The key strategic driver of IKEAs success is its no nonsense approach to retailing that has paid rich dividends for the company and its shareholders (literally and metaphorically). The biggest strength that IKEA has is its clear vision, which is to add value to its customers irrespective of the market conditions. This has translated into an articulate and well-defined business strategy and an approach to retailing, which is pioneering in its simplicity and deadly in its targeting of competitors and effective in its positioning. Another key strength of the company is its clear concept which translates into an array of products that can be assembled by the customers themselves leading to humungous cost reductions which are then passed on to the customers. With its single-minded focus on cost leadership, IKEA has emerged as the worlds leading retailer of furniture. IKEA measures its strengths using the metrics provided by the KPIs or the Key Performance Indicators that include increased use of renewable materials, smarter use of raw materials, establishing and maintaining long-term relationships with suppliers and leveraging the efficiencies and the synergies from the economies of scale. Given the fact that IKEA operates in multiple countries around the world, it is a high scale and a large size business meaning that it is difficult to control standards across locations. Though the company tries its best to implement uniform quality across its product range and throughout its locations, replicable and scalable control of quality is a key weakness. With its obsessive focus on cost leadership, quality sometimes goes for a toss especially in the present context where the costs of many inputs and raw materials has gone up and which has impacted the profitability of the company. The point to be noted here is that it is sometimes difficult to maintain quality in the context of increasing costs and the need to replicate standards across its locations worldwide. There are environmental concerns about IKEAs operations and the company faces challenges in communicating and articulating its environmental policies to its customers, shareholders, and other stakeholders. With its green business model, the company has a huge opportunity waiting in terms of attracting customers who like to buy such products. The rise of the ethical consumer or the process of buying known as Ethical Chic which means that customers would ideally like to buy products that are environmentally conscious is an opportunity waiting to be tapped for the company. Perhaps the biggest opportunity that the company has is its cost leadership, which means a single-minded focus on cost at the expense of everything else. While this has raised concerns about quality, the customers do not seem to mind as they are getting their moneys worth and the addition of value to the customers is another significant opportunity. The other opportunity lies in the companys expansion into the emerging markets and the developing world where it has an untapped customer base that can be leveraged for effective profitability. IKEA is already drawing up plans to enter markets like China and India with a clear strategy of cost leadership, which it hopes, would yield benefits to the company. IKEAs low cost business model has been imitated and copied by its rivals, which means that the company needs to constantly innovate if it has to stay ahead of the competition. For instance, several regional and local companies have caught on to the DIY bandwagon and are also focusing on costs which means that to stay nimble and agile, IKEA has to come up with newer strategies. With the advent of the internet and online shopping, DIY as a key driver of strategic success is no longer the sole USP or Unique Selling Proposition of IKEA and with the proliferation of online retailers who can provide even lower costs because they do not have a physical presence means that they are snapping at the heels of IKEA. IKEA is a well-known global trend and through its innovative business model and its focus on products, processes, and systems, it has managed to stay ahead of the competition in the furniture retailing business. The company can diversify into other products and product lines as it can replicate its business model in other realms as well. To do this would require fresh thinking and a new approach to its strategy that would combine low cost leadership with additional drivers of success like scalability and focus on quality. Finally, the company can enter the emerging markets where its products and its business model are likely to be met with success and the untapped customer base can be leveraged.